King John VI used the throne from about 1819 until his death in 1826, while ruling from Brazil. 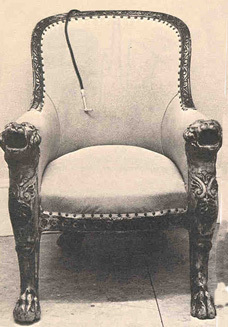 The King’s chair was equipped with a large receiving apparatus concealed beneath the seat. Its hollow arms were elaborately carved to represent the open mouths of grotesque lions and were arranged to act as receivers through which sound was conveyed via a single tube hidden in the back of the chair. Visitors were required to kneel before the chair and speak directly into the animal heads. A replica of the original chair is housed at the Amplivox/Ultratone corporate office in London. Amazing post, thanks for sharing. Just a correction: King John VI came to Brazil escaping Napoleonic invasion of Portugal in 1808 and in 1815 changed the status of the whole portuguese empire to the United Kingdom of Portugal, Brazil and Algarves. By that time the ruler was actually still his mother, D. Maria I. King John reigned from 1816 to 1825. He returned to Portugal in 1821, leaving his son D. Pedro I in charge of the colony. Having being raised in Brazil, D. Pedro I was in fact a nationalist and eventually declared the independence of Brazil from Portugal in 7 Setp. 1822, becoming Brazil’s first emperor. Soon after the death of his father he was compelled to go to Portugal to fill the throne, and left his infant son, D. Pedro II, to become the second emperor of Brazil (in the due time). Republic was established in Brazil only in 1889. It is a peculiar story. Thanks for your comment and correction. I’m trying to focus more on the instrument maker and the technological aspects of the story, but it’s so nice to have the background context! And I agree–it is a peculiar story! Do you know whether King John VI was deaf, or whether he suffered with serious ear diseases? Was the chair commissioned by him or presented as a gift? Hmm, no idea, but I can surely check with a historian friend of mine and see if she knows. Just gimme a couple of days. Apparently king John VI BECAME deaf with age. Recent studies of his exhumed entrails showed he might have been poisoned to death with arsenic, supposedly injected in oranges (it never stops getting more and more peculiar, isn’t it?). But arsenic poisoning symptoms do not include deafness, and apparently he would have comissioned the chair earlier on. The website (in Portuguese) http://sulp-surdosusuariosdalinguaportuguesa.blogspot.com/2009/05/o-trono-acustico-de-d-joao-vi.html, a website about deaf people users of the Portuguese language states that the chair was made in 1819 by F. C. Rein of England specially for the king. The source they quote is the book Antique Hearing Devices, by some Elizabeth Bennion. From what I can understand of the quotation the positioning of the tubes’ openings at the mouths of the lions was not necessarily just to disguise them, but mainly to make petitioners kneel in front of the king if they wanted to be heard by his Majesty. This is totally in tune with the Portuguese court ceremonial historic of postural humiliation of petitioners when addressing the royal family. The site also speaks of a resonant box put beneath the chair (from where I assume the pipe would lead the sound to the king’s ear). 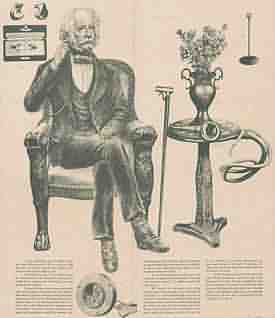 Just found a Portuguese site that in the very first line of its chronology of Deafness in Portugal states that in 1823 (hence after he had comissioned the chair) king John VI hired Swedish expert Per Aron Borg to organize an institution/school for the deaf in Portugal mirroring the institute he had conceived in Stockholm. This institution was mantained initially by the king himself. It makes sense, doesn’t it? The information you posted is fantastic! Yes, I agree there’s a peculiar history involved in this story–the particular and social contexts regarding the decision to create the open-mouthed lions and the kneeling are so interesting–especially when we take into consideration the functional designs of an instrument! Thanks once again for your insightful comments and helpful suggestions. You are welcome. I admit I was captivated by the details of the story (that I did not know about, in the first place). Very curious, indeed. By the way, are you going to the HSS Annual Meeting in Montréal? I am going to the HSS Meeting! But alas, I’m not presenting. We should surely meet for tasty coffee and discussion! I’m not familiar with the city, but if you are, feel free to pick a place and time. Will you be presenting on your research? It sound exciting and revealing–and yes, perhaps even a common link might turn up. I sent you an e-mail to jai.virdi@utoronto.ca but am not sure it arrived, since I got no answer from you. Basically it wanted to say that yes, I will be presenting sort of a summary of my thesis’ main ideas and evidences, and that although I am no expert in Montréal’s geography we should surely meet for a coffe or something. We may be able to pick the most convenient time and date as the schedule of the event is made available (is it already?). So sorry! I checked my email and for some reason your message ended up in the spam folder. Beto, arsenic was a common 19th century treatment for syphilis, which does cause deafness. Is there any evidence that King John VI would have had syphilis?